My eldest child started middle school today so to distract myself from feeling old, I'm posting about old fashioned clothing. It makes sense in my head. Let's round out my 1850s obsession with the Raspberry Truffle. 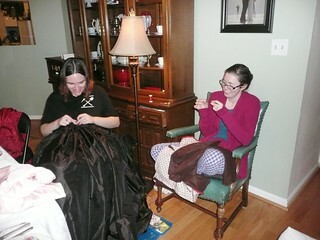 I don't have in-progress pictures of this dress because it was made between January 3, 2011 and January 14, 2011. I posted a question on LiveJournal about what fabric to use for this dress on the 3rd and flew out to the event on the 14th. For those of you keeping track at home, that's 11 days from idea to completion. Oh, and to complicate things, it was the end of the first semester at school so I was up to my ears in grading. I am insane. 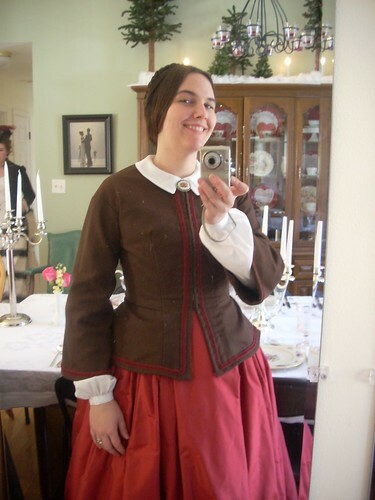 I didn't really have anything in my stash to make a full dress, so I decided an early 1850s jacket and petticoat was the way to go. The jacket was a brown 100% wool suiting I had in my stash from a lucky Joanns find and was lined with a reproduction red and white cotton print. 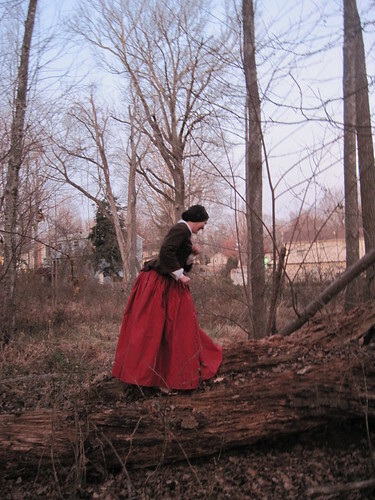 The petticoat was a length of red silk taffeta my friends had bought for me in the fabric district in 2008. The only thing I bought specifically for this project was some braided trim. Go me! 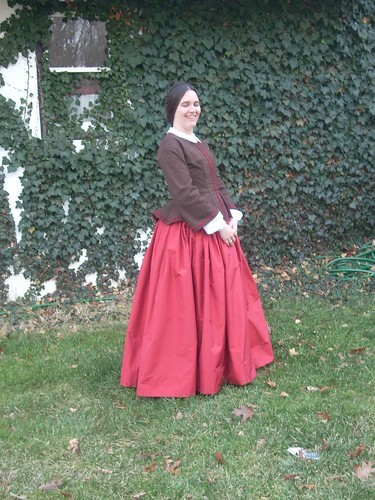 The bodice was modified from the Laughing Moon Ladies Round Gown pattern, which I'd previously used for a cotton day dress. I added the skirts to it by extending the bodice down into triangular pieces, making a mock up, and futzing with it on my dress form. There is a vertical dart that runs close to the center front and a horizontal dart at the waist. Despite the waist dart, I still got a wacky wrinkle in the skirt. Clearly I didn't have time to fix it for the original event, but I did for Costume College 2011. 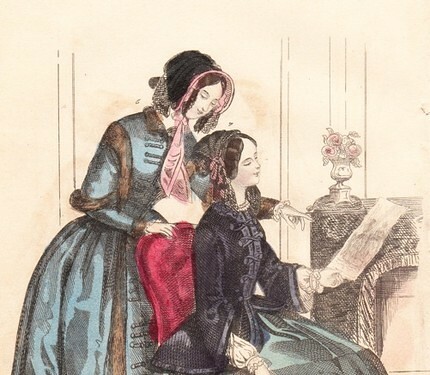 The petticoat is just three lengths of fabric pleated to a waistband. 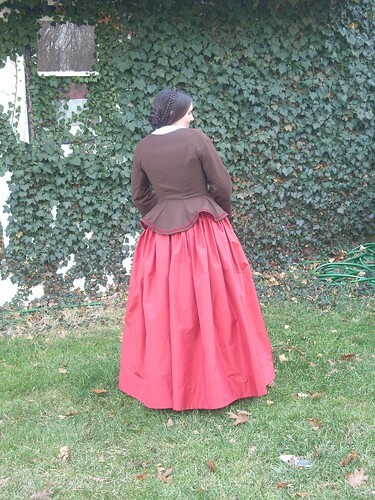 I faced the hem with white muslin, but otherwise there's nothing exciting about the petticoat at all. 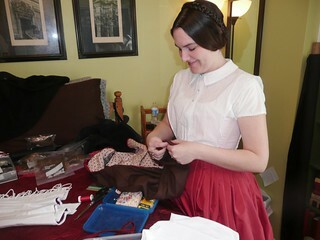 Since this dress was made in such a hurry, I continued the time honored tradition of sewing at the event. Actually, I fixed some terrible cartridge pleats for Aubry of A Fractured Fairytale while she finished sewing down binding/hems on mine. 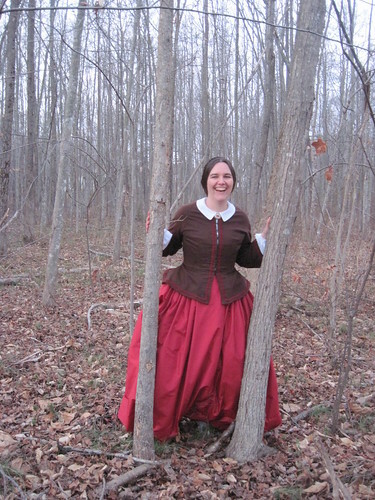 I wore the dress over my chemisette and undersleeves from the Fringed Fabulosity. I really do love the way this dress came together and the way it looked when my hair was corralled into something fairly decent. That last picture is lovely. The petticoat is a nice pop of color against the subdued background of trees and leaves, but it also does add a bit of spice to the leaves at the same time. And you look so happy!